Around this time of the year, most schools are already accepting applicants for the next school year. Many parents are now in the process of either scouting for their child's first school, big school, or may be planning to switch to new one. Choosing a school is just not that simple anymore. As I continue to receive encouraging feedback from my recent post about traditional and progressive schools, I guess this would be a good time to address other concerns from parents I have talked to and emphasize the importance of finding the best learning environment for your child. I am not pro nor against any specific school setting. Each one has it's own strengths and weaknesses. I believe that aside from the school's standard of education, the child's needs and personality are equally crucial factors in picking the right school. My goal here is simple: To share this information, especially to parents like me, and hopefully help in making enlightened decisions when it comes to your children's education. If you haven't read my earlier post on progressive vs. traditional settings, it would be best to go through it first before proceeding with this one so you'll have a better understanding of the main differences between these two school settings. 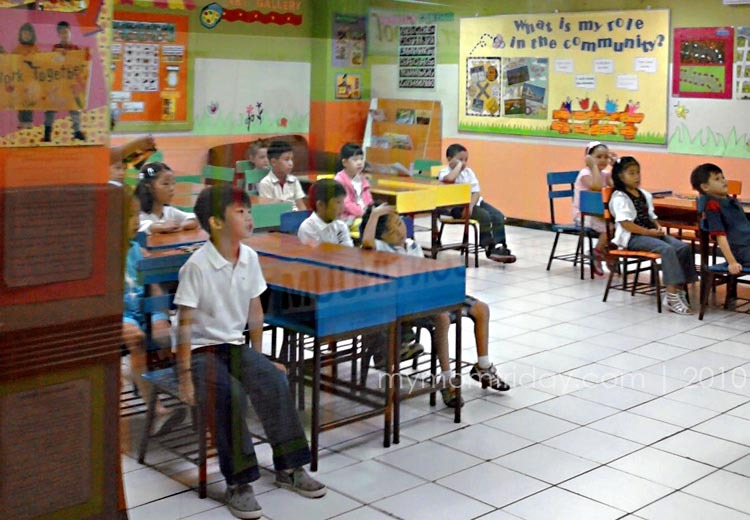 For this follow-up post, I sent an email to Ms. Didi Manahan, directress of Explorations Preschool and Keys Grade School, and she was gracious enough to further explain some points of concern from her presentation during the forum. Q: What are the differences in Methodologies of each school setting -- 'pictorial and abstract' vs. 'concrete, pictorial and abstract'? A: In traditional schools, lessons are predominantly conducted through pictorial (illustration or picture based) or abstract (separate from concrete experience or symbolic) means. Teacher uses whole group demonstrations or lectures, and workbooks to teach. In a progressive setting, especially in the preschool and early elementary years, learning experiences always begin with concrete or immediately significant experiences before progressing to pictorial and symbolic/abstract. Concrete - When children learn about making a set of 10, the child will make sets of 10 using different concrete manipulative materials. Pictorial - After several experiences, the child might be asked to use a worksheet with pictures of sets of objects and check the sets of 10. Symbolic - Child will be asked to write the numeral representing the quantity of the set. Q: What do you mean by External Discipline vs Positive Discipline? A: In a nut shell, 'positive discipline' involves strategies that acknowledge that children are poorly socialized and are expressing their feelings in an inappropriate manner. Thus, teachers not only limit the inappropriate behavior, they acknowledge the feeling of the child and teach or ask the child to problem-solve an appropriate behavior. "I know you're angry, but you may not hit. You need to use your words." The end result of strategies such as these is that children learn to control themselves and become independent. Strategies that make use of punishment and predominance of rewards tend to make children externally motivated or dependent on the reward that is received or avoidance of punishment. Traditional schools have high school levels which help students transition and prepare for college, while most progressive schools don't have high school. Eventually, they will move to the bigger traditional upper schools. So there is an impression that kids might not be able to cope with the demands of traditional high schools and colleges. Q: How are progressive schools preparing students for the next level? A: This kind of thinking is (as stated above) an impression. Often this is based on the misimpression that to reach an end goal, you should experience a watered-down version of that end-goal. The misimpression has no basis in theories of cognition or learning. It also comes from a lack of understanding that progressive education is precisely that, preparation for the next level by focusing on the needs and abilities of the child at the current level. Progressive schools advocate theories of cognitive development and learning. John Piaget is an example. Piaget advocates in his cognitive theory of development, that the individual processes information in different ways at different stages. In grade school, the child is concrete operational -- he develops an ability to think abstractly and to make rational judgement if there is concrete or observable phenomena. In high school, a student who is formal operational can think about abstractions without concrete or observable phenomena. The student who is given opportunities to process information, taking into account the stage of development, is the child who learns. For Piaget, if the child isn't given opportunities to think, acknowledging his stage of development, the child will not progress to the next stage. Thus, an elementary child who is given opportunities to make judgements, to think abstractly with concrete observable phenomena, is far better prepared for the next level as compared to the child who is not. 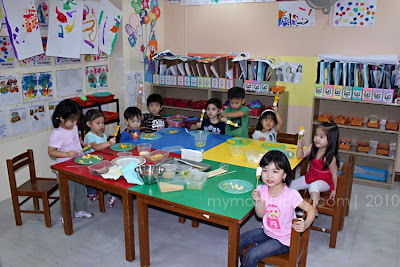 Read more about Reedley as featured in momblogger Noemi Dado's post here. Teachers practice "management by walking around"
The theory of integrative learning has roots in many other learning theories, among them, Situated Cognition, Constructivism, Project-Based Learning, and Multiple Intelligences. Integrative Learning distills those theories down to a few main truths. First, in order to learn, education must be student-centered and student-driven. Assignments must be relevant, both to the child, and to the world around them. There is an emphasis on exploration, real-life experiences, and hands-on projects and lastly, there are many ways to learn, and no one way is better than another. There is a strong belief that children learn more by active experience than by memorizing and retrieving facts. They will develop language, math, and reading skills by removing the walls between subjects and making connections between them. Students will be more actively engaged with projects that use real-life situations and problem solving skills, adding a social consciousness to the process prepares the student to be an active and productive member of society in a more comprehensive way than traditional curricula. Value is placed on the process of learning through experience and interaction. Learning occurs as students gain exposure to a variety of individual perspectives. Construction of knowledge based upon a comprehensive view of learning. Student-centered learning is the essence. Lessons often start with the components of a particular concept presented first. Teacher instruction without much dialogue encouraged. Students work individually versus in groups. More value is placed on testing or results, versus the process or application of knowledge. Learning is best assessed based upon the scores on exams. Aside from the seminar I have attended, I actually first learned about progressive education, the philosophy and it's history from this site. Progressive School does not necessarily mean Good. Does the school address your concerns and criteria? Is it the best learning institution for your child's needs? To be honest, it is really stressful just thinking about this major decision we have to make. There are so many considerations that parents need to weigh in. Talking with students and other parents would also provide valuable feedback and inside information on the schools you are looking into.